It's a truism to say that different people have wildly different food tastes, and so it can be hard to know which cookbooks to recommend. Narrowing it down to vegetarian makes it easier but a quick glance at the shelves of a good bookstore shows that the number of choices is still bewildering. Nevertheless, Everyday Greens stands out head and shoulders from the crowd of other books as one of the best available. On opening the book, it is immediately appealing. The paper is high quality, and the there are some attractive watercolor illustrations decorating some of the pages. There is a high quality of design in the formatting of the recipes, using different fonts and colors for the title, description, ingredients, and instructions. With nearly 400 pages and nearly 250 recipes, it is packed full of ideas, and with 18 pages of index, it is easy to find your way around the chapters. The greatest strength of the book lies in its combinations of flavors and textures. Sommerville draws on a wide variety of different cooking traditions in this collection, including traditional American, Italian, Chinese, Japanese, Indian, and Thai. The recipes are highly distinctive but are simple enough not to scare away even novice cooks. For example, there's a tasty Macaroni and Cheese, using heavy cream, yellow onion, garlic, herbs, Dijon mustard, cheddar and Parmesan, with garlic bread crumbs sprinkled over the top then baked in the oven. A simple side dish is basmati rice with pumpkin seeds, with just butter, salt and pepper. For the Fall, the Butternut Squash and Chestnut Soup is very satisfying, and for striking colors, I recommend the Asparagus and Beets salad with lemon vinaigrette. The instructions are clear and easy to follow. Sommerville has a great ability to create strong tastes that complement each other beautifully, and browsing through these eating suggestions is a delight in itself. 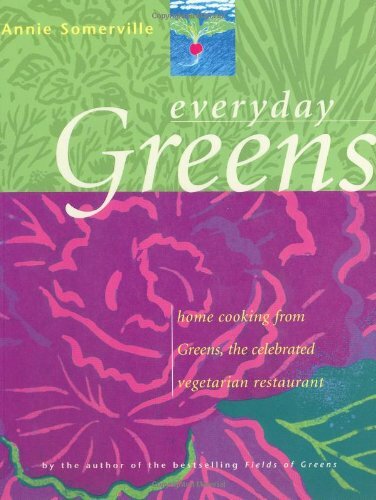 While Deborah Madison's Vegetarian Cooking for Everyone is till the best comprehensive non-meat cookbook on the market, Everyday Greens is probably the most pleasing to handle and use. Highly recommended.